President Barack Obama had a pretty good month in the polls last month, as he saw his approval take a big step up and his disapproval take a tiny step down. Obama exited the summer doldrums earlier than usual this year, and chalked up a positive month all around. Let's take a look at the new chart. After falling a whole point in August, Obama saw his monthly average job approval rating rebound almost exactly the same amount (0.9 percent) to wind up at 45.5 percent. His disapproval numbers didn't change quite as noticeably, improving by only 0.1 percent to finish at 50.3 percent. 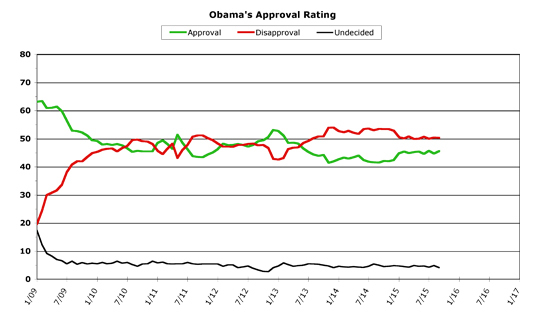 For the past few months, there has been somewhat of a disconnect between Obama's approval (which has swung up and down roughly a whole point every month) and his disapproval (which has held a lot more steady). As in August, there was plenty of political news in September, but little of it had to do with President Obama. The Republicans held their second presidential debate, and two candidates dropped out of their packed field. John Boehner broke the biggest political news of the month when he announced he'd step down at the end of October both from his position as Speaker of the House and from his House seat. This bombshell revelation allowed him to cut a deal to avert a government shutdown at the end of September, thus postponing it until after he's gone. This exposed the disarray of the House Republicans in a major way, but again, this didn't affect Obama all that much. The other big story in Washington this month was a visit from Pope Francis I, which consumed an entire week's worth of news (but, again, had nothing to do with Obama). Obama did make some news at the beginning of the month by getting his Iran nuclear deal through Congress, which probably helped him improve his ratings (not so much for the deal as for the sudden absence of all those apocalyptic ads against the deal on people's television screens). Obama also visited Alaska, which forced the major television networks to show some of the immediate effects of global warming. And although it hasn't aired yet, Obama banked some future goodwill by filming an episode of "Bear Grylls Runs Around Nature With Celebrities" (or whatever the actual title is, I admit am too lazy to look it up). 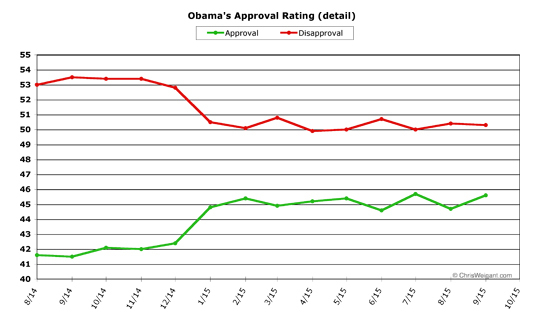 This should give Obama a little feel-good boost from the public before the end of the year, when it gets aired. 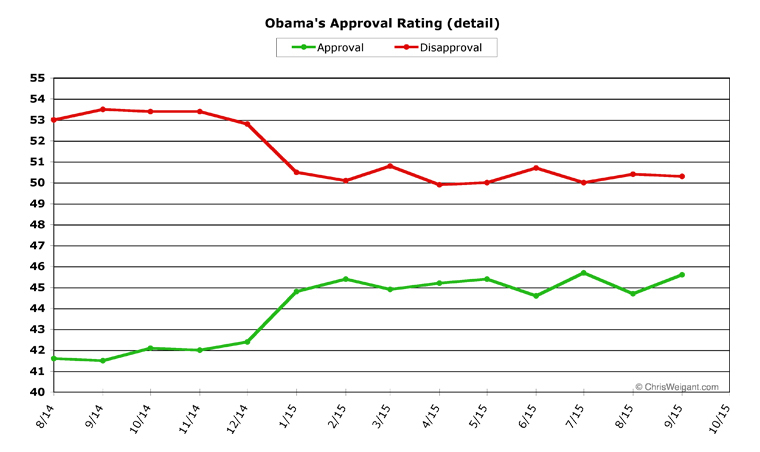 The overall trends for Obama have been the same all year long, and might be called "remarkably steady." During the course of 2015, Obama's job approval averages have only fluctuated inside a range of 1.1 points (from 44.6 to 45.7 percent). His disapproval has been even steadier, only shifting within a 0.9 percent range (from 49.9 to 50.8 percent). September continues this trend, although Obama might just break out of it in October. This has been -- by far -- the steadiest year Obama's ever had. His ratings aren't great -- he's still roughly five points below water (disapproval greater than approval) -- but they sure have been stable. He began the year with a big improvement over all of 2014, and he then consolidated his gains. However, he has been largely unable to post any further gains. This can be clearly seen when we zoom in to see the past year in greater detail. Over the course of September, Obama's poll numbers were more stable than they've been in the past three or four months, with smaller day-to-day fluctuations. He began the month in his worst spot (44.7 percent approval, 51.4 percent disapproval), and then saw his approval rating climb after winning a clear victory in Congress on the Iran deal. However, from this point on Obama's approval rating slipped back a bit, from a high of 46.3 percent back to 45.4 percent at month's end. His disapproval rate improved markedly at the start of the month, but never climbed back much, and Obama hit his best number (49.3 percent) right at the end of the month. This disconnect between approval and disapproval has been going on for the past few months, but may be about to come to an end. The statistical numbers do some funny things when the two lines get close to interacting, which likely explains this oddity. The "undecided" numbers have been low all year, mostly down below five percent. But this shows signs of abating, meaning more people moving from disapproving of Obama's job performance into the undecided category. Again, it all could indeed be a statistical anomaly, caused because all the individual polls which feed into these numbers do not handle undecided answers the same way (some pollsters don't accept "undecided" as an answer and instead push people to choose either "approve" or "disapprove," while most pollsters just record "undecided" and move on). The trendlines at the end of the month were a bit contradictory. Approval was down a bit, but so was disapproval. Which makes it anyone's guess what will happen in October. October will not have a big budget battle in Congress (that's scheduled for December), unless Boehner somehow comes up with a magical deal with Obama to cement his legacy (before leaving right before Hallowe'en). October will have two presidential debates, including the first Democratic one, but these likely won't impact Obama's job approval much if at all. The only news from the campaign that might tangentially affect Obama would be if Joe Biden jumps in the race, but the effect would likely be minimal. Hillary Clinton will be testifying at yet another Benghazi hearing in the House, but this is almost assuredly going to affect her ratings with the public more than Obama's. October could also end with a gigantic battle among House Republicans over who to elect as their next leader, but this likely won't even affect Democrats (much less Obama), as the entire fight will be over whether they want a far-right leader or a seriously-far-right leader. This all adds up to the spotlight not being on the president much at all in October. 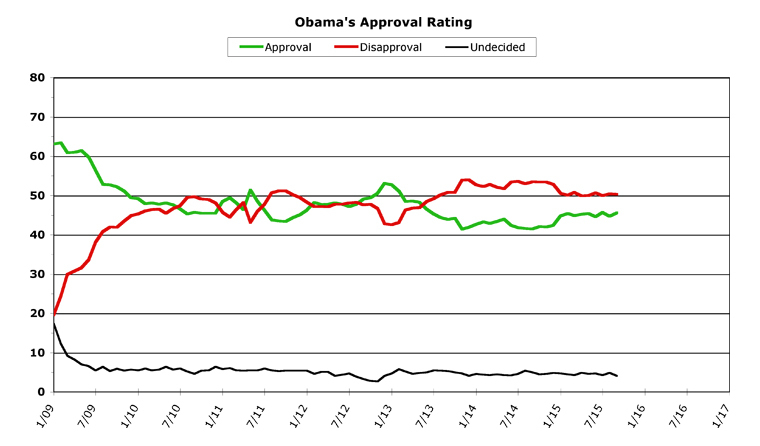 The safe bet is that Obama's approval ratings will stay fairly steady throughout the month. However, I'm going to climb slightly out on a limb and predict that October is when Obama's gains in job approval are finally reflected more accurately by a matching fall in his disapproval. I think such a correction is overdue, and the signs look good for this to show up in the next few weeks. I think October could compliment September's numbers by Obama showing a large drop (maybe a full point) in disapproval, while his approval stays roughly the same. Maybe that's just my gut talking, but at this point my gut is cautiously optimistic. Obama's visit to Roseburg might have an effect on his numbers. To hold a partisan agenda press conference while they were still counting their dead in Roseburg is the lowest of the low..
One, or a few, people saying Obama is not wanted in Roseburg does not a consensus make. Obama will find a very cold shoulder if he goes down there.. Especially since he blatantly STATED that he was politicizing the tragedy, even while the dead bodies were still warm..